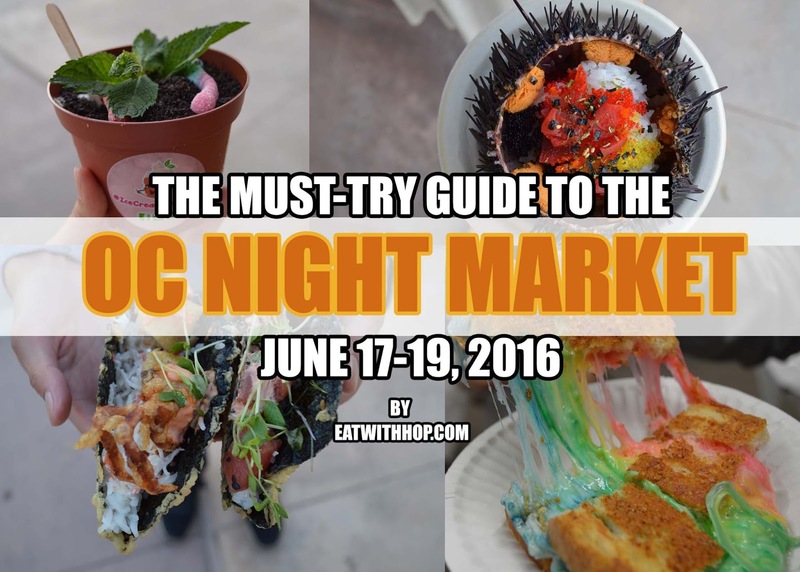 THE MUST-TRY GUIDE TO THE OC NIGHT MARKET THIS JUNE 17-19 - EAT WITH HOP! 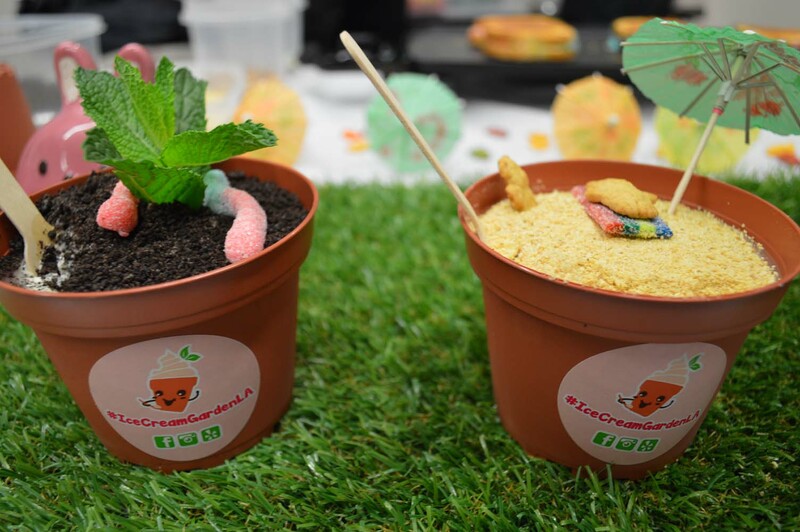 will serve up the cutest plants...that you can eat. I love the worm infested plant. Underneath is yummy vanilla ice cream but they'll be offering others such as green tea and chocolate! I especially love the beach one with the cutest little bear getting its tan on while laying on a colorful mat. So creative! I love digging in and eating these! 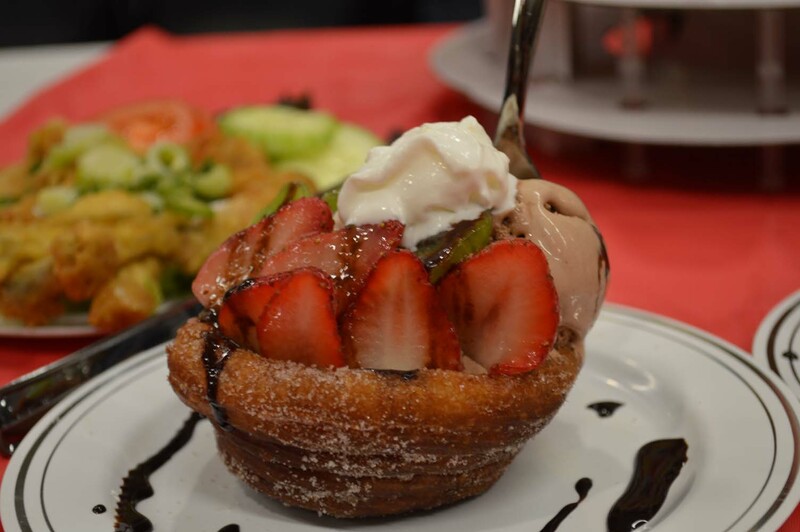 will be offering CHURRO BOWLS filled with fruit and ice cream. 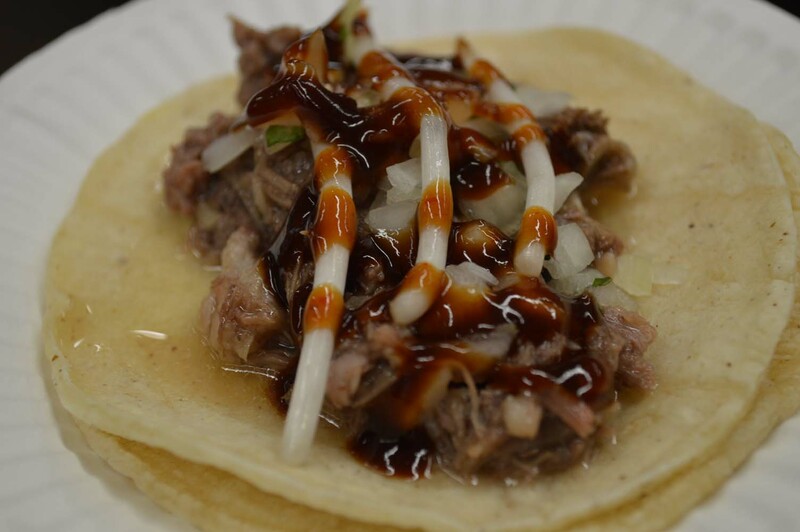 It will be the first time ever for the OC NIGHT MARKET to have these! 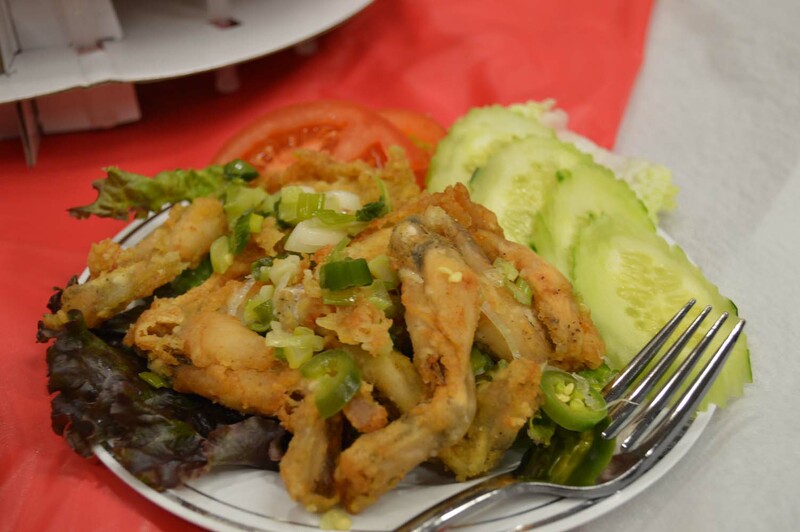 Frog Legs. Do you dare? It tastes just like chicken! Also by Jasmine's Sweet Treats! 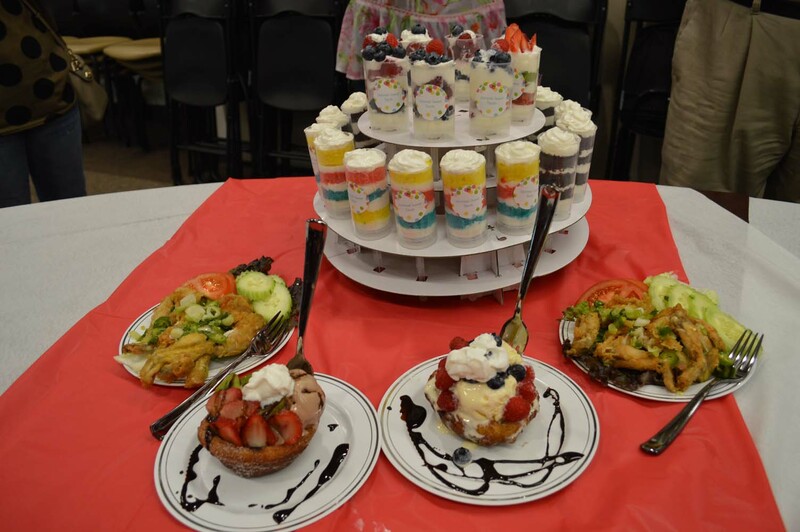 Of course, Jasmine's Sweet Treats has got you covered on the dessert. 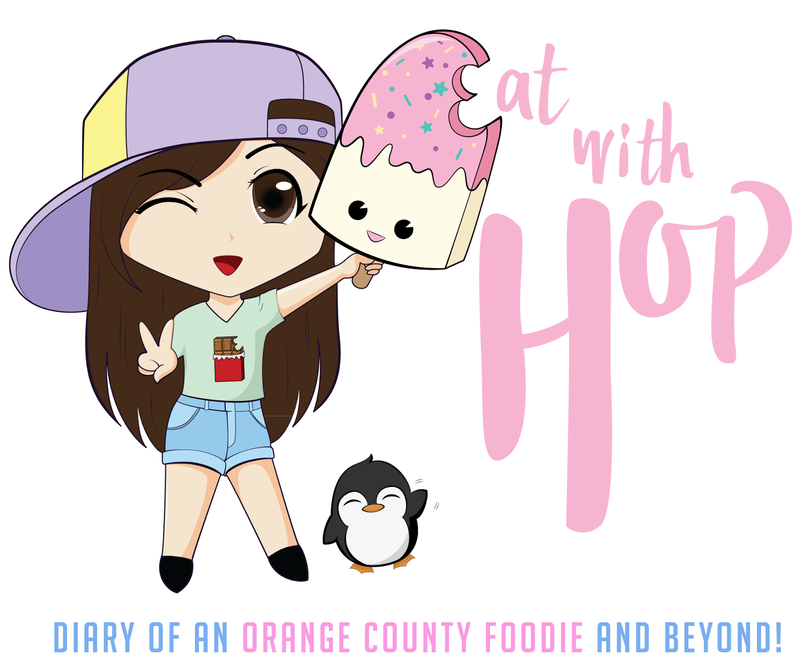 After eating frog legs, get their churro bowl and cake push-pops! I think the cake push-pops are convenient to save for later or just to walk around with while juggling your other food! 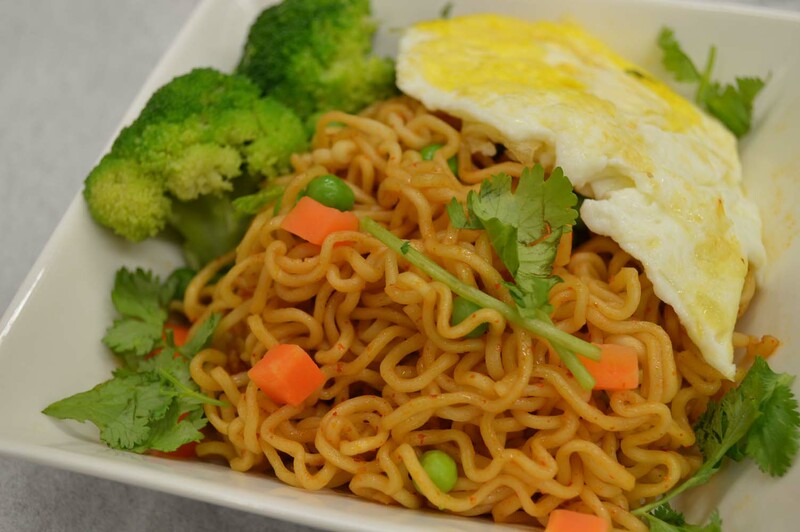 @INDOMIE has got their famous Mi Goreng. 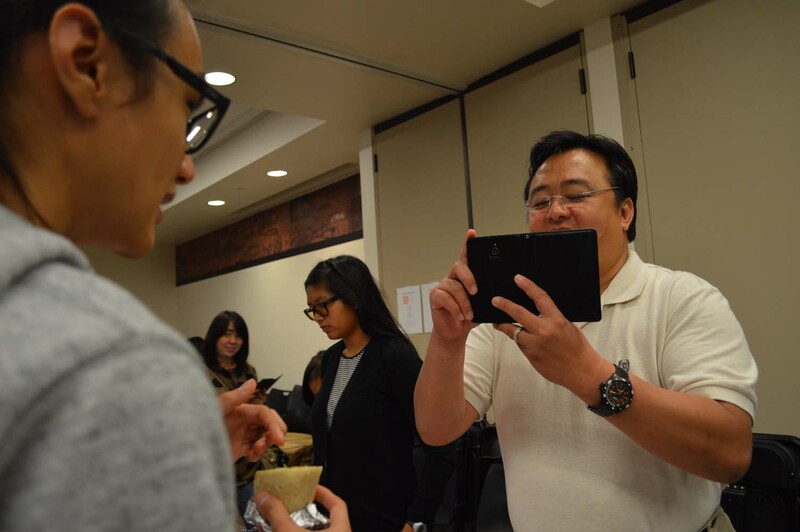 Remember eating those instant noodle packs as a kid? Now they've upgraded so that you don't need a bowl, just your hands! 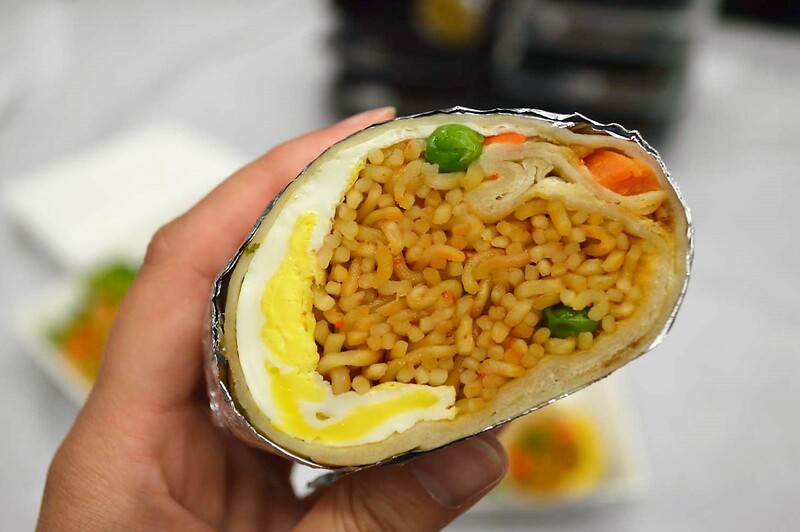 Get their Mi Goreng burrito which also has eggs and veggies! Each order will also get you free packs of the instant noodles! Here is Kevin's shining moment. He is being interviewed by the @INDOMIE staff on his reaction and opinion on the burrito! How cool! 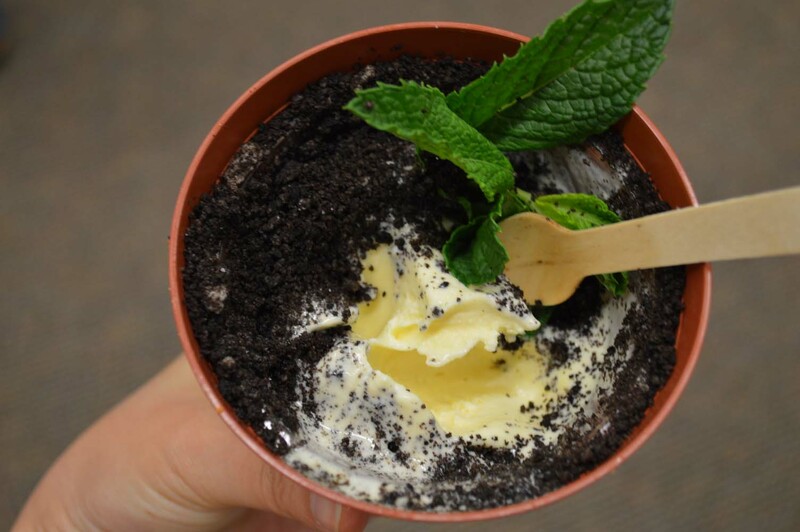 Did you think @ICECREAMGARDENLA only sold...well ice cream gardens? 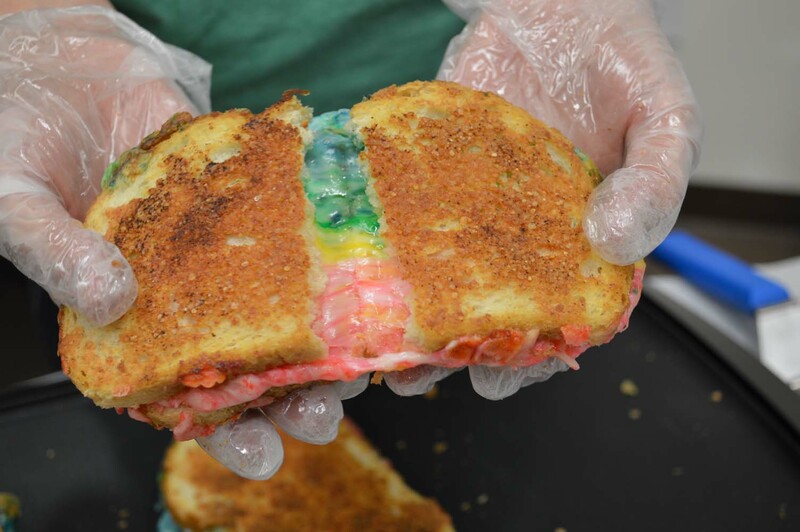 They will be serving these yummy rainbow grilled cheese sandwiches too! I know I previously thought the idea of colorful cheese as weird...but when I tried these I was pleasantly surprised! It's actually ... DELICIOUS! The bread itself is covered in garlic parmesan so when grilled it gets crispy and gives you the extra cheese flavors! 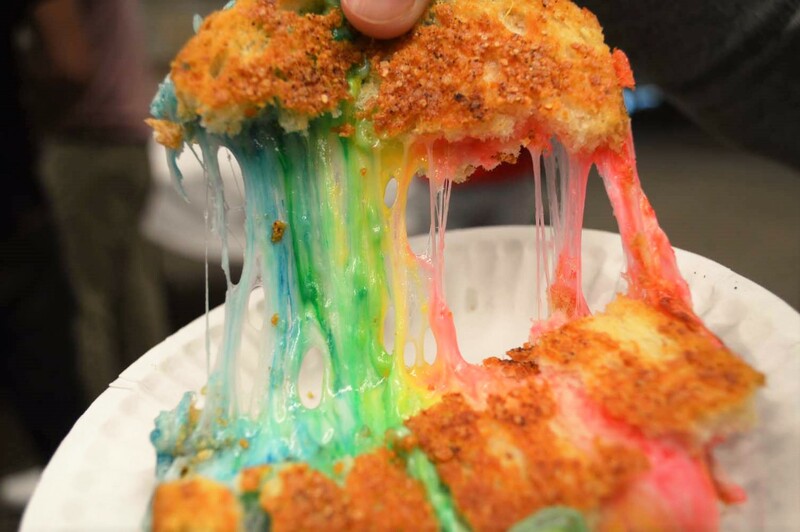 The cheese inside the sandwich itself is dyed with natural food dyes according to the creators. But who cares how it looks.. Kevin and I loved the taste! It was a yummy grilled cheese sandwich that also looks cool! Cookie shots are what I'm into. What about you? 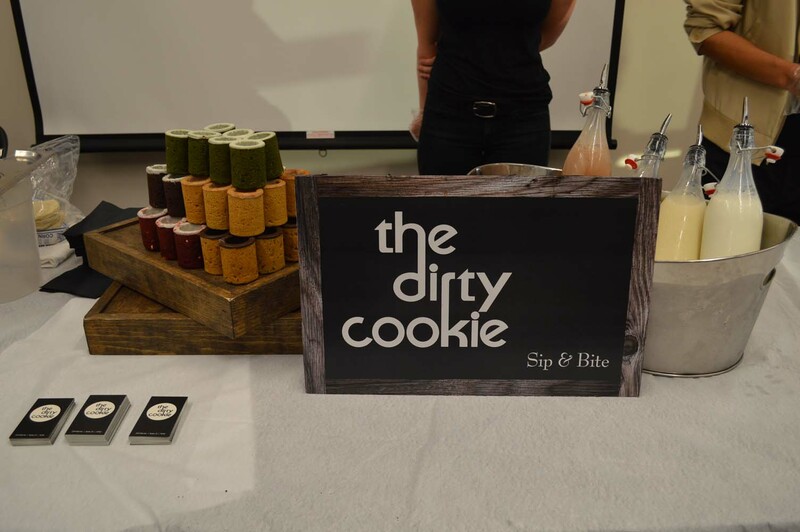 I love the concept behind @THEDIRTYCOOKIE! 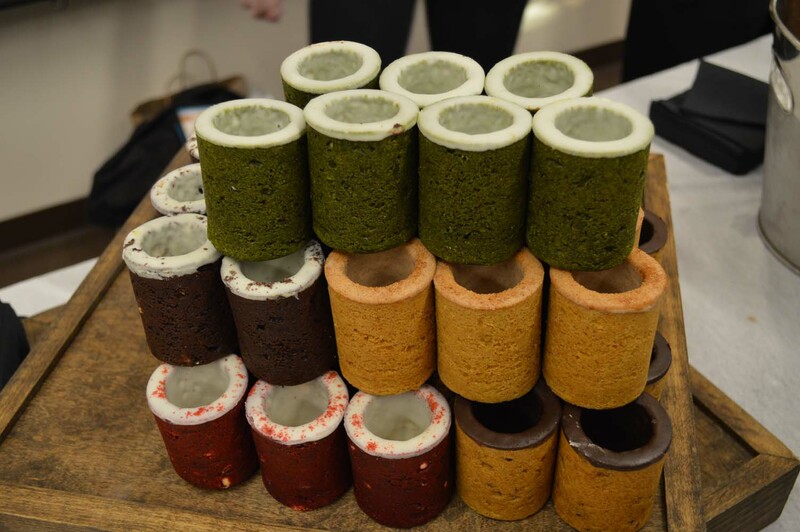 They mold their cookies into cup shapes so that you can pour your choice of beverage into to drink! I usually get the vanilla cream because it's a nice light sweet drink that complements the cookies well. I personally wouldn't get the normal milk. My favorites are the Matcha (which is so legit btw) and the Chocolate. Both are rich in flavor! 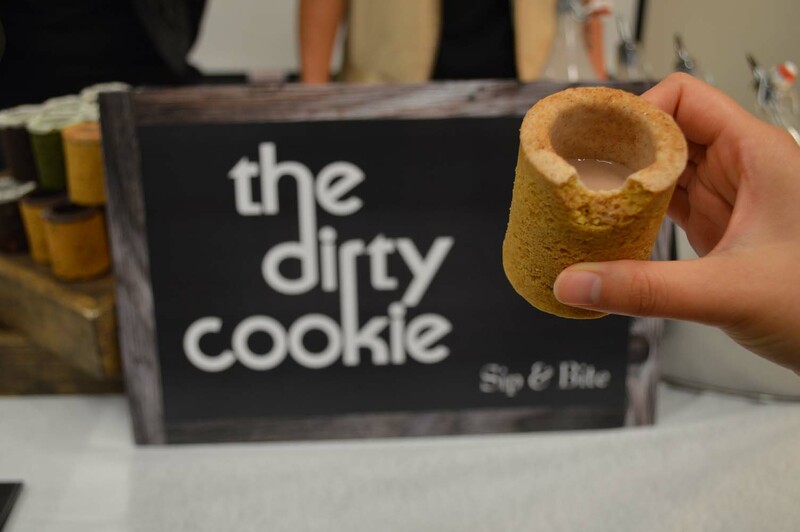 The Churro cookie shot is great with chocolate milk! They will also be debuting a brand new cookie cup at the OC night market: UBE. I cannot wait! 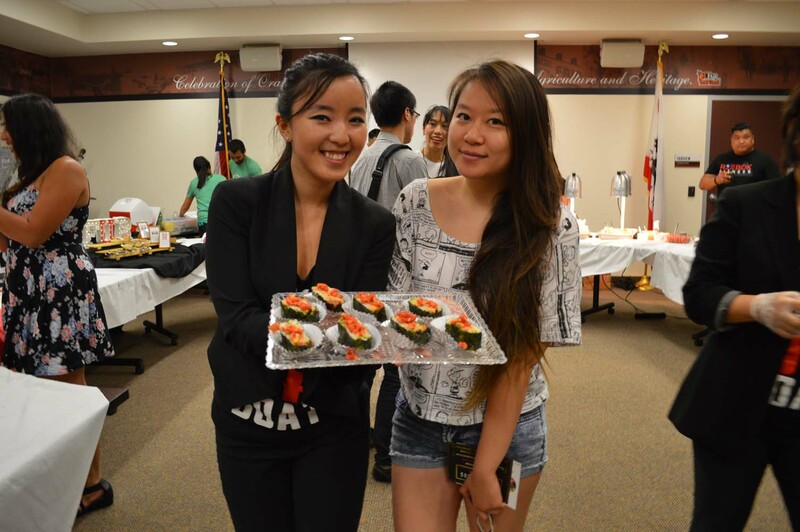 WFUB will be combining two faves: musubis and poke! And you see the photos? Yes, that is hot cheetos you're seeing! When you buy from their booth, you will also be participating in their raffle! Gotta look under your order to see if you win a pair of tickets to Disneyland! Oh and you can keep the boat too! 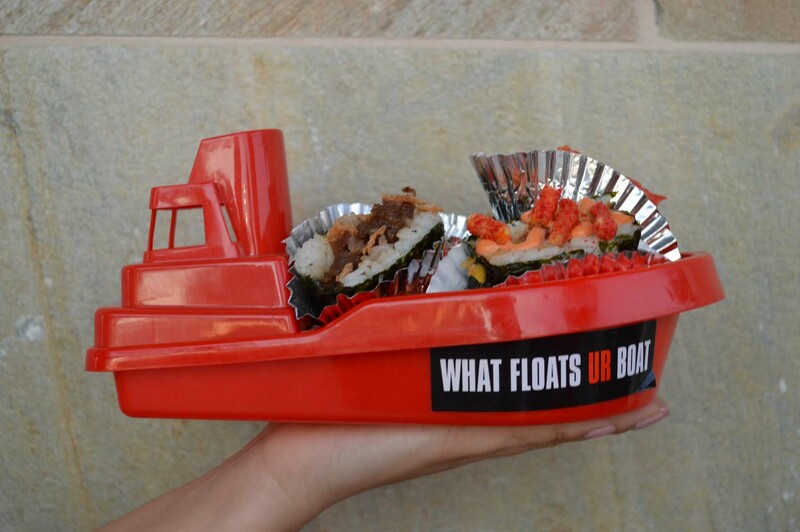 Here I am with the creator of What Floats Ur Boat! 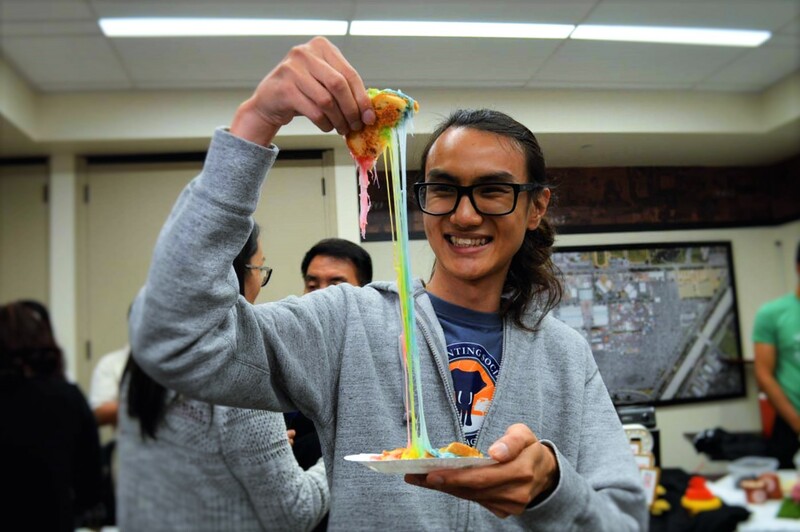 Banh Mizza is delivering a new concept of Viet Fusion: Banh Mi Pizza! 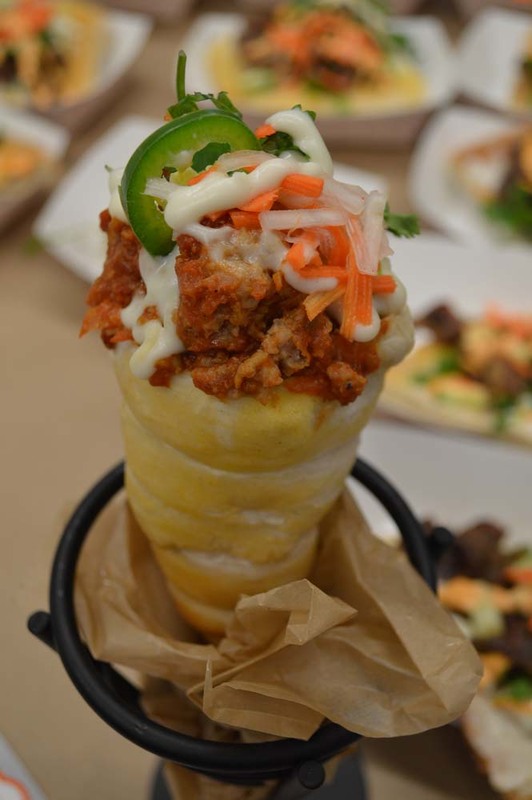 Here is a Vietnamese Meatball Pizza Cone. Whoa... what? This seems like something you'd get at Disneyland! 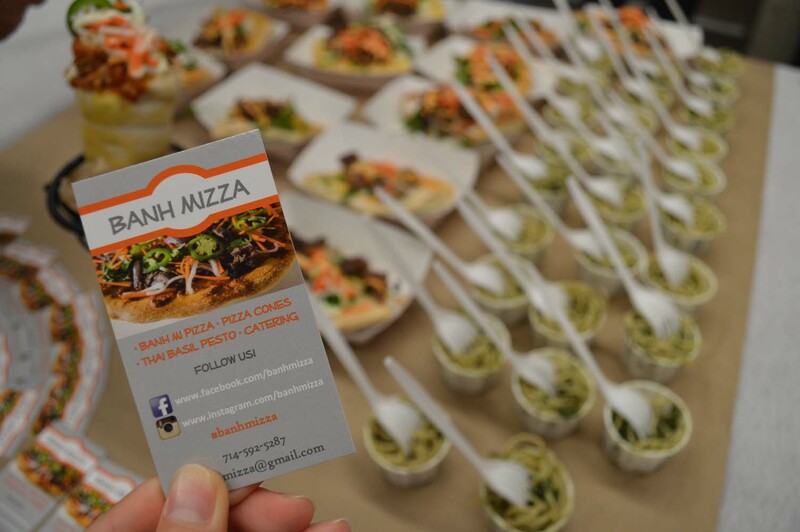 Introducing the Banh Mizza which is a banh mi in pizza form! 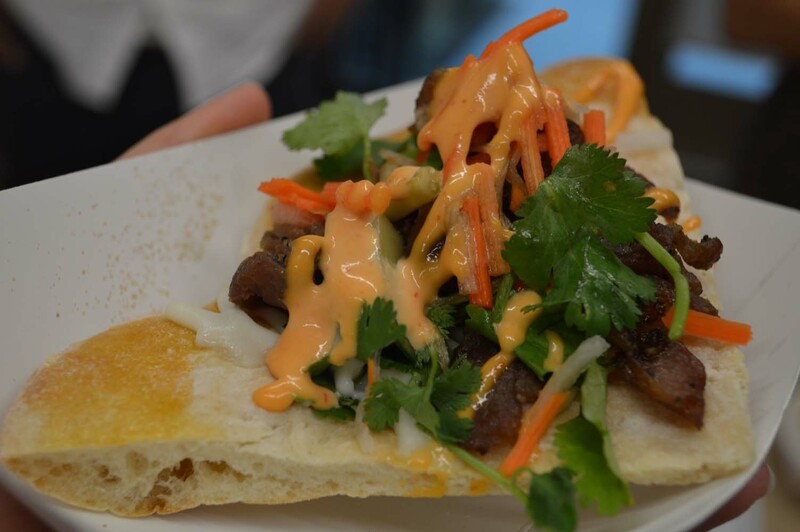 The actual pizza dough part is made of baguette and topped with all the essential banh mi toppings! I recommend lots of Jalapenos if you can handle the heat. 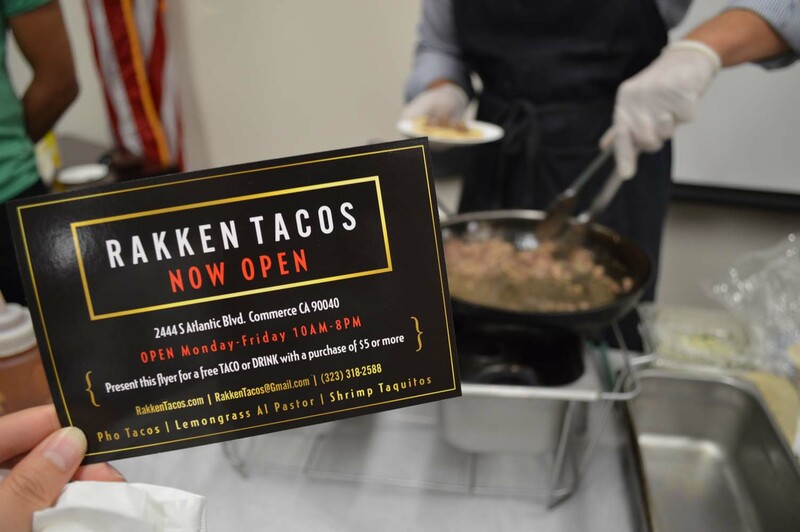 has bomb tasting Pho Tacos. One bite of this and I instantly tasted tasted all the flavors a bowl of pho would have...conveniently in taco form! Look how juicy it is! Oh my goodness! 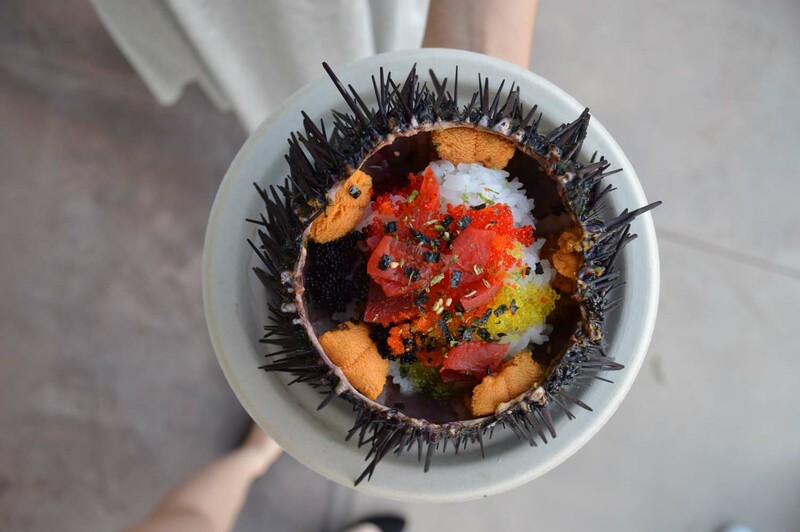 If you've never had uni, you need to have it this weekend. 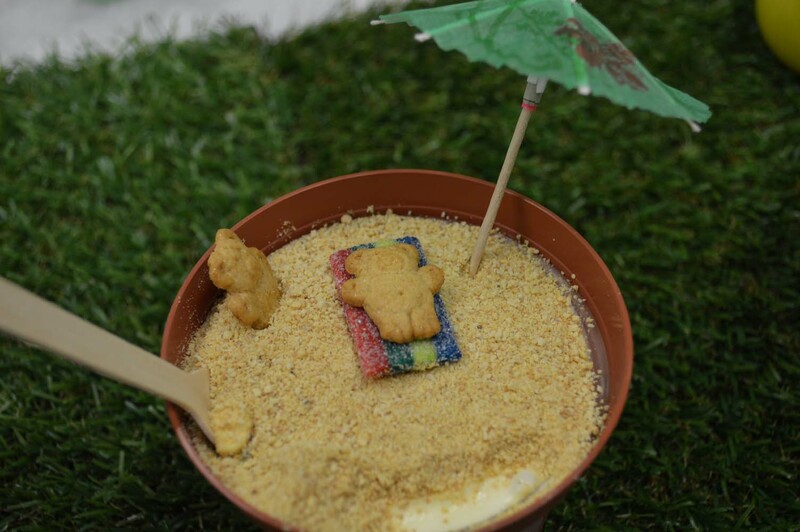 The UNI BOWL from BEACH LIVE is perfect with all the fillings. Of course you will get to taste what fresh uni actually tastes like. No one likes it otherwise. 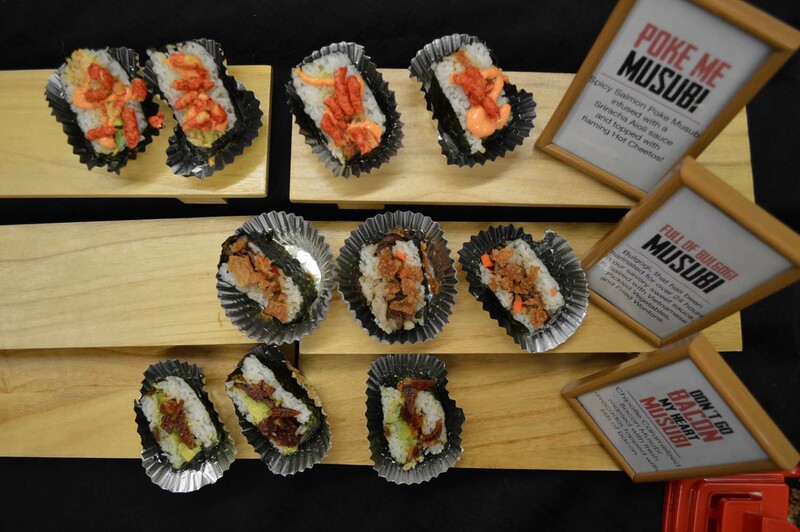 And not only do you get to eat it out of the uni itself, it is also filled with sushi rice and poke! Yum! Don't be a square... oh wait unless you're a donut. 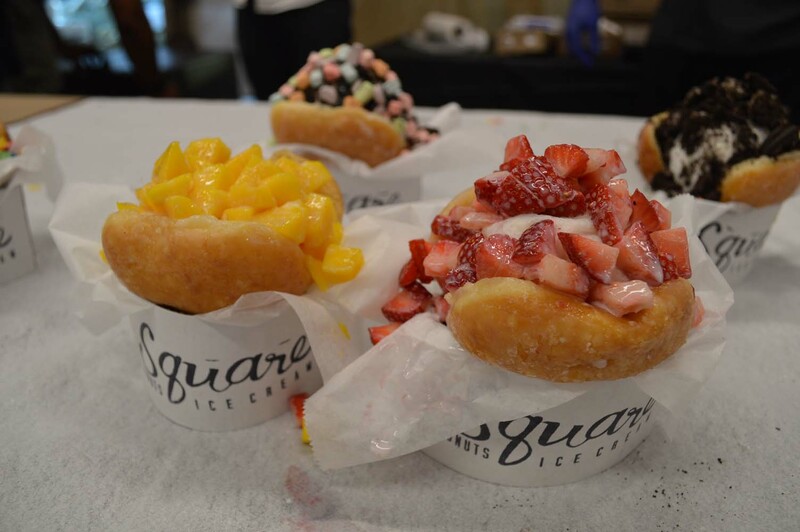 SQUARE DONUTS will be offering a variety of ice cream flavors such as UBE and THAI TEA and classics likes VANILLA to go with their SQUARE SHAPED DONUTS! Also, fresh fruit is a must as a topping! specializes in lobster mac and cheese croquettes. 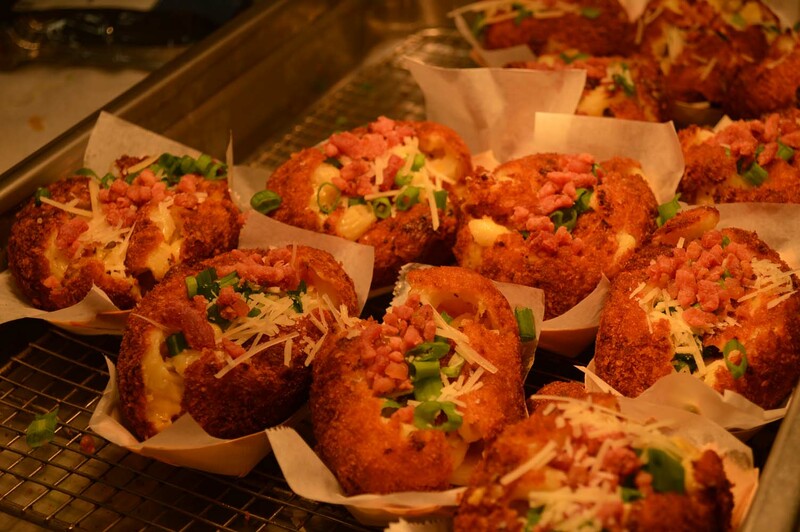 You read that right...LOBSTER MAC N CHEESE INSIDE CROQUETTES! That are also topped with bacon and more. 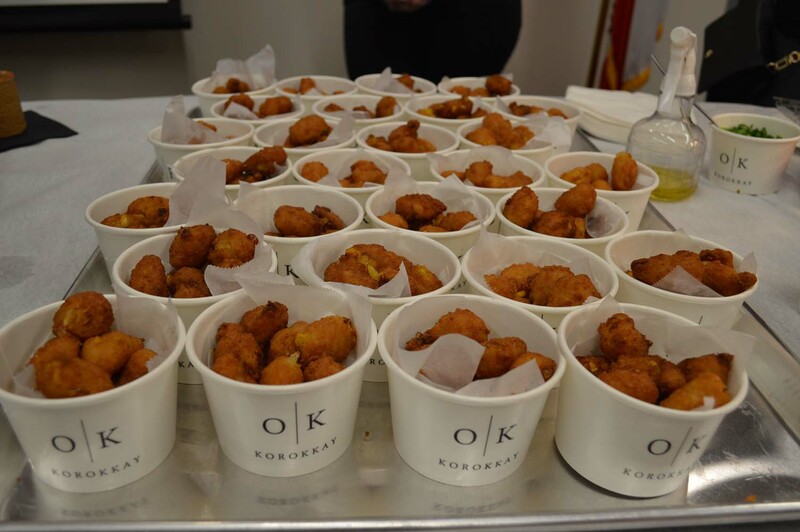 will also have mini corn croquettes hot and ready for you. 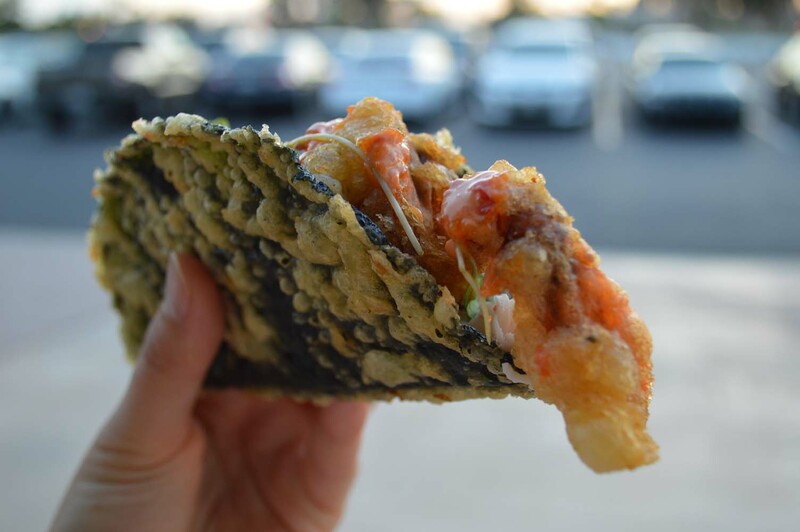 I love that name... Nori means seaweed and origami is the art of folding and ... well the art of folding seaweed into a taco shell is genius! 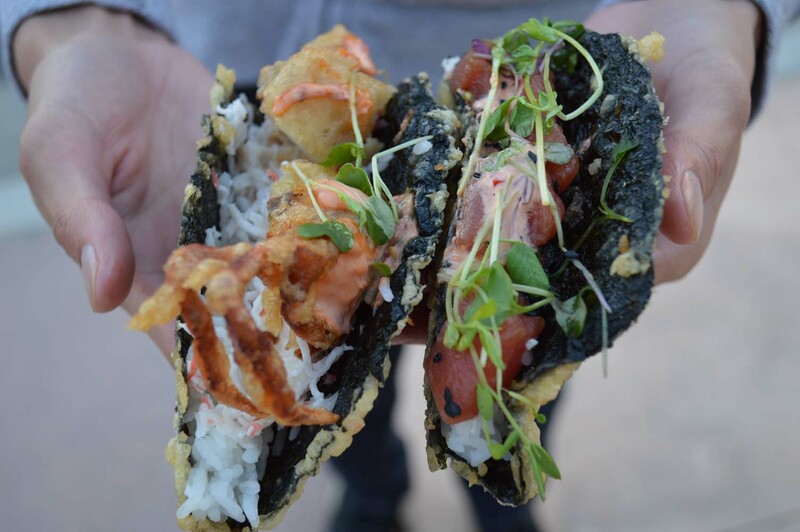 There is soft crab or spicy poke for you to choose from all inside a delicious seaweed taco shell! 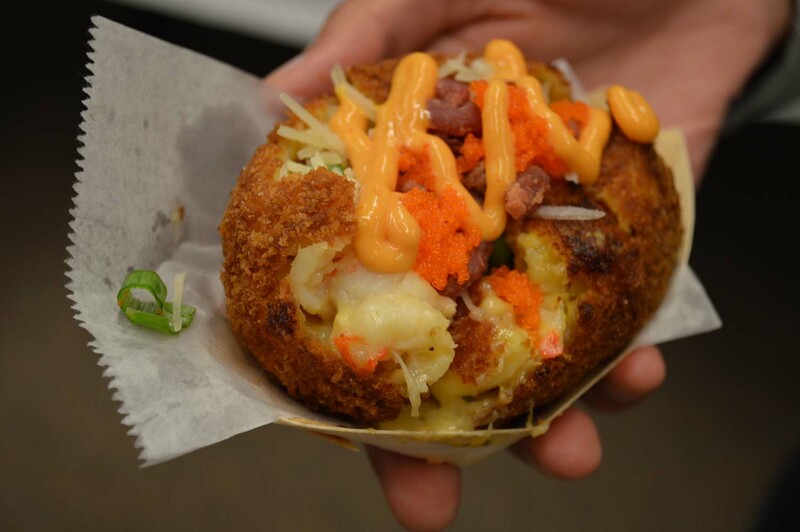 →COMPARED TO LAST YEAR'S (2015), THE NIGHT MARKET THIS YEAR HAS SO MUCH BETTER FOOD. FRANKLY, I WAS DISAPPOINTED LAST YEAR AND FELT LIKE I WASTED PARKING AND MONEY AND TIME. BUT THIS YEAR THERE ARE SO MANY MORE UNIQUE VENDORS! YAY! SEE Y'ALL AT THE NIGHT MARKET! HAVE A WONDERFUL WEEKEND EATING!